I find pieces of art which span the globe in their origin. These pieces are not always done by artist who are native to or even reside in those distant lands. More often they are by artists who have travelled to those lands of or have been sent to them. In this chapter a couple of pieces from Egypt. I have found little information about #RMurdochWright but he was a talented artist. The paintings of his that I have seen are mainly of Egypt. 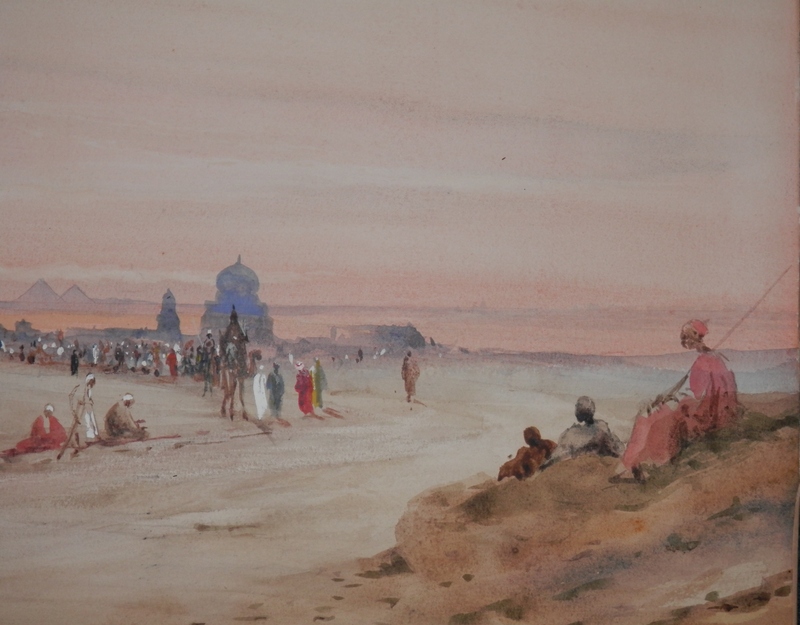 This one portrays a group of people awaiting a procession which has left the city in the background. I believe this city to be Luxor. This ancient city was the start of many a procession which took in procession the gods from their temples to Karnak, Deir el-Bahri and the royal memorial temples along the Nile’s west bank. These processions were the only time that the people would see their gods. They travelled from far and wide and set up camp so that they would have favourable sight-lines to see their gods as they processed by. With very fine brush work and a natural rendering of both man and animal. 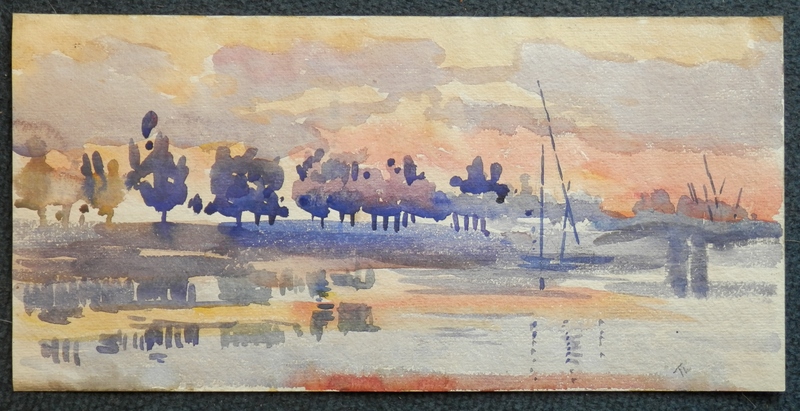 A lovely sense of space and perspective catch the viewers eye and draws one in. Warm in colour. All of these aspects join together to ask the viewer to wait for the procession to pass by. From the fine work of Murdoch Wright to what looked to me to be some interesting splashes of colour to create an image. This painting is also interesting in that it has an image on both sides. 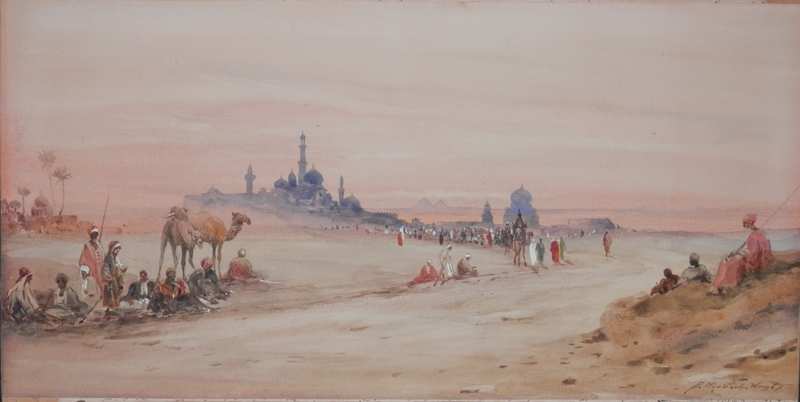 The first image is titled Bahr el Ahmar, Jezira, Cairo while on the reverse it is titled The Left Flank Dock. Both are done with splashes of colour large and quick brush work. Even with their brash brush strokes they exude a depth of feeling. With a vagueness of image yet they exact a feeling of correctness. An artist who paints what he sees but allows himself a freedom to interpret what he sees. 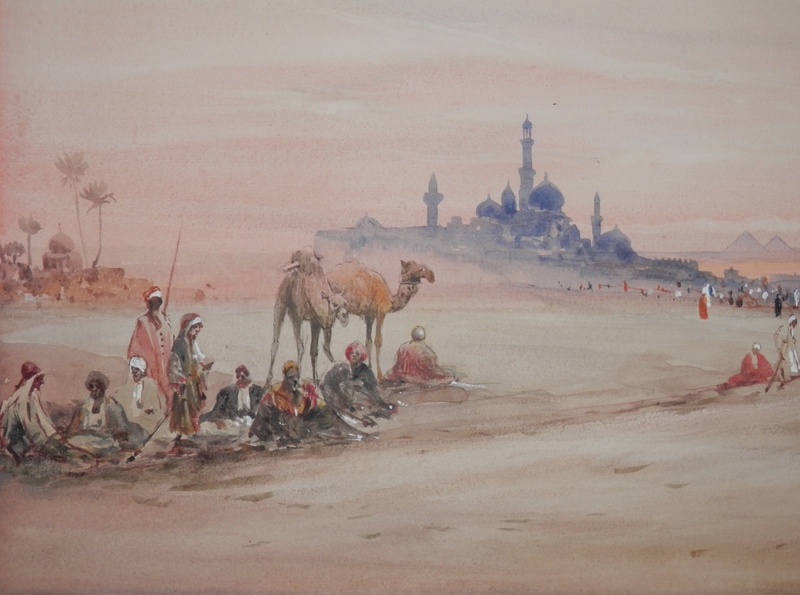 This entry was posted in Watercolour paintings and tagged Arab, boats, camels, dock, dune, Luxor, palm trees, sand, shore. Bookmark the permalink.